Despite the world’s aging population, suitable clothing for the older community is a largely neglected area. 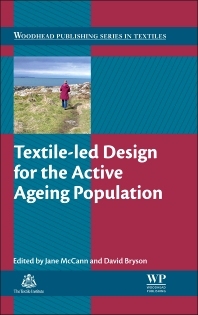 This book considers the needs of the growing number of active older people and investigates how recent developments in textiles, fibres, finishes, design and integrated technology can be deployed to serve this group and improve quality of life. Part I provides an understanding of the active aging population by considering the group’s experiences of and attitudes towards clothing and reviewing the barriers to their adoption of new wearable technologies. Part II focuses on the needs of the older population, including effective communication with designers and the age-related anatomical and physiological changes that designs should consider. Part III reviews design requirements and processes, and finally Part IV reviews the manufacture of suitable apparel, with chapters on suitable textile fibres, balancing technology and aesthetics and wearable electronics.